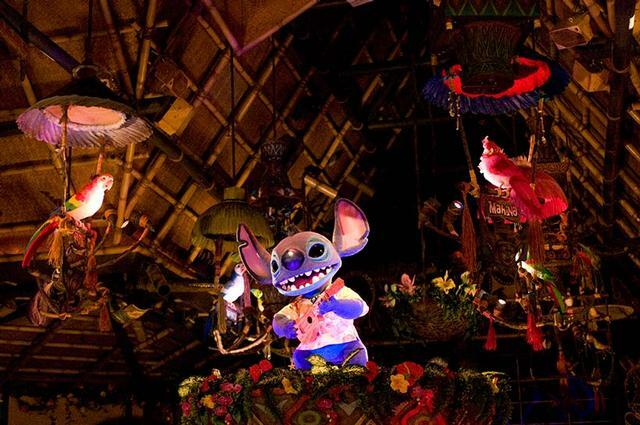 The Enchanted Tiki Room is a animatronic show in Adventureland at Tokyo Disneyland. Readers say... skip it. Now showing "Stitch Presents 'Aloha E Komo Mai! '," a variation on the classic Enchanted Tiki Room show, but with the alien creature from the Hawaiian-themed Disney animated film "Lilo & Stitch" interrupting the show. "Aloha E Komo Mai," which means "hello and welcome" in Hawaiian, debuted in 2008 and features music from the Lilo and Stitch movie and television series, in addition to excerpts of songs from the original Tiki Room show.